Over the last couple of weeks, a common thread that’s surfaced in several lessons is the use and understanding of arpeggios. In the world of music, we approach arpeggios from two different angles: 1) through chords and harmony & 2) as the backbone of melodic and solo content. With this lesson, we’ll explore a couple examples for practicing arpeggios to further understand them in the terms of melodic content. For this lesson, we’ll focus on the three arpeggio shapes based on the A minor scale (ABCDEFGA). The arpeggio for any chord is built off the root, third, & fifth of said chord as it appears in the chosen key. The A minor chord in the key of A minor is spelled – A, C, E, where A is the root, C the third, and E the fifth. Play through each arpeggio shape a couple time to get familiar with it. Always start and stop on the root. In the charts above, the note highlighted in red is the root. Pull out your trusty metronome, and practice a comfortable tempo, playing each in quarter notes, eighth note, triplets, and sixteenth notes. Gradually build your speed by bumping up the tempo on your metronome 4 beats at a time. i.e. 60, 64, 68, etc. 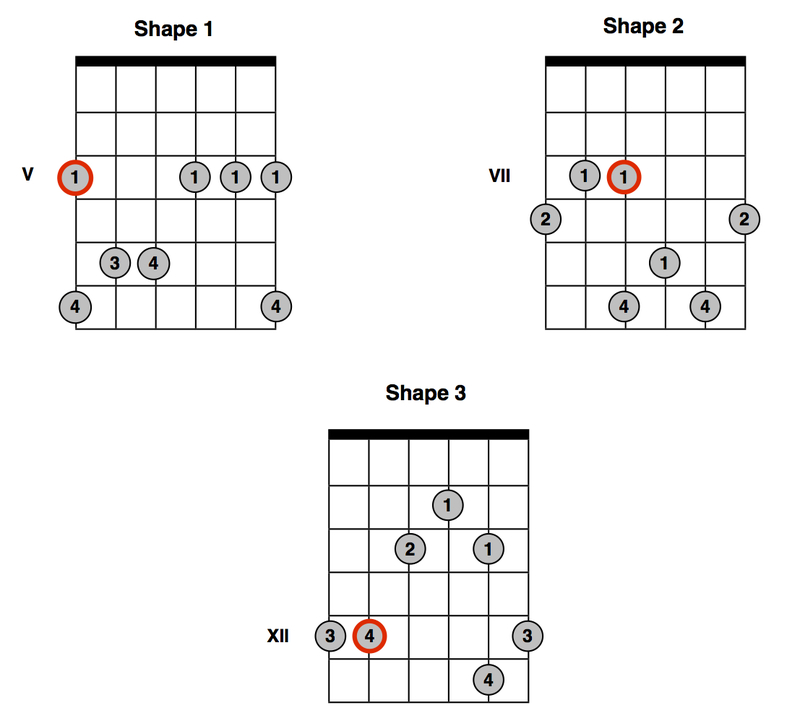 Once you’ve gotten to know these arpeggio shapes, start exploring different patterns to play. The way, you’re creating deeper connections with you technique, and melodic creativity. Experiment with using these shapes in different keys across the neck as you wish.